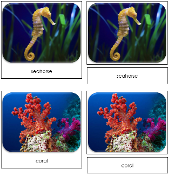 These photographic images compliment the "Coral Reef" Safari Toob. The images are of those figures included in the Toob set. The file includes cards in single card format (pictures with labels) and a 3-part card format (pictures with labels, pictures without labels, and labels) for each. Two styles of cards are included. Cards with label are approx. 3¾" x 4½", cards without label are approx. ¾" shorter.